It’s less that a week to go until knitters, crocheters, stitchers and sewers everywhere unite to celebrate Yarn Shop Day on April 30th, 2016. Presented by Let’s Knit magazine and sponsored by the British Wool Board and The Campaign for Wool, the day was originally a celebration of traditional bricks and mortar yarn shops and provided a valuable opportunity to promote all that is great about British yarn. While Baa Baa Brighouse is an online store, we will be supporting two Yorkshire craft stores in their attempts to celebrate Yarn Shop Day. The Yorkshire Makery in Slaithwaite, Huddersfield, will be stocking our very own hand dyed yarn, Baa Baa Brew, especially for the occasion. 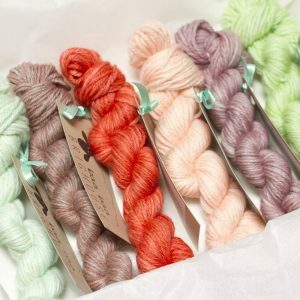 The full range will be available to squish, squash and purchase along with boxes of 25g Baa Baa Brew Mini Skein Boxes. Further north in the beautiful historic city of York, The York Makery, a brand new haberdashery shop situated at 36 Gillygate, will be opening its doors for the very first time. Inside you will find a selection of gorgeous Baa Baa Brew just waiting to be bought and cast on for your next woolly project. If you visit Baa Baa Brighouse online on Yarn Shop Day, you will also be able to save some pennies at the checkout by using discount code YARNSHOPDAY which will entitle you to 15% off your order (exclusions apply).